Tome of the Undergates, published by Pyr (US) and Gollancz (UK) in 2010, was one of the most talked-about debut novels. Coming from one of the youngest authors in genre fiction, it almost divided those who read it - some enjoyed it, others didn't. Set in a new world and the start of a new trilogy (The Aeon's Gate), Sam Sykes took us on a journey with Lenk and his adventurer comrades as they engaged in the search for a magical, titular tome - along the way facing ship battles, demons, a strange island and, most dangerously of all, each other. Despite it being a Big Fat Fantasy Book (which I rarely get along with as I wander off in the first half more often than not), and a slightly bloated one at that, I enjoyed it. I've also found out that it's a bloody hard book to review. See, Tome is a really interesting book with some great moments and a consistent undercurrent of potential, but it never fully realises it, yet perhaps that's why I enjoyed it more than most. A lot of this novel feels as if it should be trimmed down. Arguments between the characters are too long, frequent and repetitive, combat sequences are also too long and stretch the limits of what should be possible and, in general, it just feels a little rough. Most of this can be explained simply by pointing out Tome is a debut novel by a younger author, and it's a labour of love that took almost a decade from conception to publication. It does show at times, but rarely does it stop the book from being enjoyable. If there is one aspect of Tome that is stronger than any other, it's the characters. They're natural, unique and are all a pleasure to read about in their own ways. Whether it's Lenk, the main protagonist, Asper the priest (a sort of secondary main character) or Quillian, a supporting character who appears in a tertiary role in the first third or so of the book - they're all distinct and have their own presence in the book. When Lenk speaks, you know it's him, as he doesn't talk like Deanos. When Deanos talks, it's clear he's not Gariath. This, along with the character-specific insults, makes following the dialogue quite easy for the most part. There's a sort-of-not-quite-character, however, that I wasn't particularly enamoured with. It's obvious from the start that Lenk has a voice in his head, but for 90% of the book it's not really explained who or what it is. It's just there, saying odd words in his head. It does lead to some interesting character moments, but largely I felt it was too much of an unanswered question, even by the end. The humour is largely juvenile fart-level jokes, but they work and I'd be lying if I said this book didn't make me laugh a number of times (more so than some books by the king of comedic fantasy, Sir Terry Pratchett). The tone also extends into a near-fetish for bodily fluids, something seemingly prevalent in mainstream fantasy at the moment, often used to imply how characters feel or to show how violent the combat can be, but there are moments where the tone and humour contrast each other to create a particularly funny scene. Sam Sykes is, without a doubt, an author to watch. In Tome alone, he shows a level of creativity and a natural approach to characterisation that makes him stand apart from the rank and file. 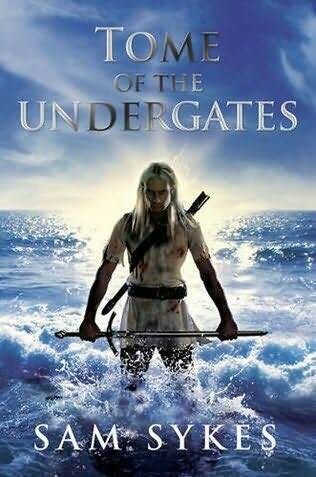 But for all its crudeness, for all its flaws, Tome of the Undergates is a compelling book that shows more potential than most debuts I've read. Yes, it's hard going at times. Yes, it's a little bit over-long. But once you hit the last ~10% and come to the end of the book, you'll put it down and be glad you fought through it.